Behold the abundantly decorated masks in a cacophony of drums, cymbals and long horns as celebration for the birthday of Guru Pasamasambhava! After your arrival in Delhi, we will meet up and give you all the information about our trip. You get the opportunity to visit Delhi with our guide. The next morning we assemble for a flight to Leh, the start of our inspirational trip. Our early morning flight brings us in a little more than 1 hour to Leh, where we have a free day to acclimatize. You can enjoy the traveler-friendly environment, the Old Town with an imposing Tibetan-style palace and fort or just enjoy the quiet of your hotel room or guest house stay. On the third day, we accompany you on a walk and visit to the Shanti palace and to Leh place, navigated by our local guide. He will tell us all about the environment and afterwards we’ll enjoy an evening stroll on the market. After an enriching day we will relish the calmness of a night in a guest house or hotel. Morning yoga class After breakfast leave to Stock. Visit Palace and village, Musium in palace house valuable antic objects, we will stroll from the village to village to meet the people and to see their daily activities, one can enter in a family house to have a cup of tea and discuss their mode of life.walk around village or hike to mountain . Drive back to leh. Night in Hotel. 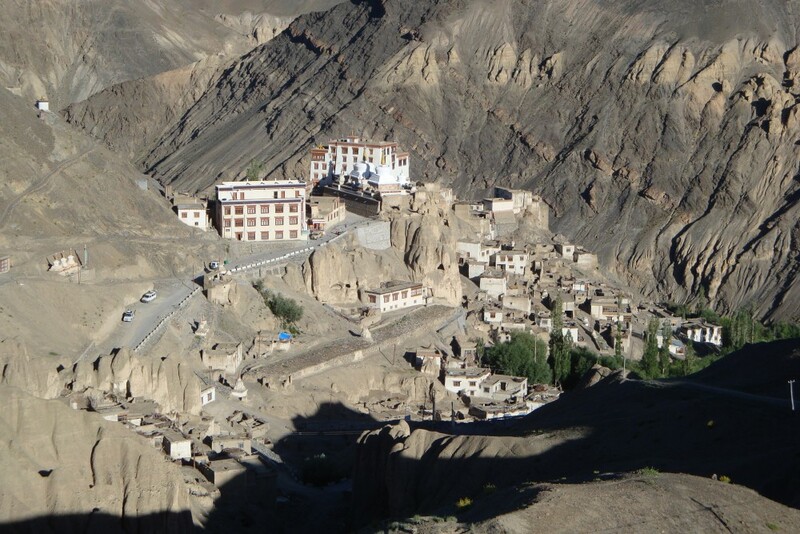 We have a fairly short drive to Likir in Ladakh where we visit the village and the Monastery. The scenery has breathtaking views over the valley and there’s a monk school opposite the monastery. The monastery is the ideal setting for a meditation session and afterwards we sleep in a home stay with a local family. We have a ride to Lamayuru where we meditate in the local Monastery. We visit the village and once again, we surround ourselves with the local people in our homestay. Day 9: Drive back to Leh via Alchi. We drive back to Leh. On the way back we have a stop to attend the morning Puja in the Alchi Monastery. After an early breakfast, we go over the Khardung La, also known as one of the highest roads in the world. It’s a 5359m high mountain pass in the northwest of the Himalaya. We pass through Khasar and continue to Diskit. In Diskit we stretch our legs and visit the monastery. Afterwards we continue to Hunder. Not by motorized traffic this time because we’ll have a 6 km walk on the sand dunes, next to the Shyok or “the River of Death”. Once in Hunder, we’ll be able to see the contrast of the green village with the arid and desolate surroundings. After our visit we return to Diskit where we stay for the night. We leave Diskit to discover Panamik, a large settlement at the bank of the Nubra where we start the visit with meditation or yoga. We keep enjoying the peace of mind while we have a relaxing soak in the hot sulphur spring water. We meditate or enjoy a yoga session. We travel back to Leh where we check in and enjoy a free afternoon. We fly back to Delhi where we have some time to visit the city. We stay in our hotel until fly back time to Europe. Room for wash and change only. Hotels and food in Delhi.